For more information about the context of this video, please click here. My part begins at the 2:18 mark. For more information about the context of this video, please click here. My part begins at the 1:04 mark. In today’s column for the Economy Lab feature of the Globe and Mail‘s Report on Business, I report on my encounter with the massive complacency of the “expert chattering classes” when confronted with the evidence about the labour shortages Canada will face in a few short years. Yes, we will adjust, but skillful adjustment takes thought and foresight. It is amazing how much effort is required to make the inevitable happen! Those of you with (reasonably) long memories will remember I reviewed the data on all this extensively in my book Fearful Symmetry. Everything I foresaw there is coming to pass…. I was also interviewed about this column by BNN. You can see the interview by clicking on the link. Alberta and Ontario lead the parade of Canadian provinces running unsustainable public finances, in part thanks to the market’s belief that Ottawa will never let a province default on its debt. 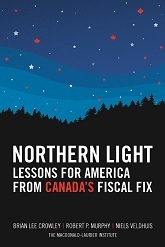 Based upon an exhaustive study by the Macdonald-Laurier Institute – Canada’s premier non-partisan think tank – this video explains the risk all Canadians face: that federal taxpayers will have to pick up the tab for profligate provincial governments. It also explains what we can do to fix the problem! On May 1, 2013 I was proud to join the launch the Macdonald-Laurier Institute’s groundbreaking series Aboriginal Canada and the Natural Resource Economy. The project launch was accompanied by two papers; “New Beginnings: How Canada’s Natural Resource Wealth Could Re-shape Relations with Aboriginal People” by Ken Coates and Brian Lee Crowley, and “Canada and the First Nations: Cooperation or Conflict?” by Douglas Bland. Watch the complete press conference including the tough questions from the media and the straightforward, common sense answers by Brian, Ken and Doug. If you’re interested in understanding the fiscal cliff looming in the US by the end of the year you might like to look at this interview I did with CTV on the topic yesterday. Also, watch for my column on the same topic tomorrow in the Ottawa Citizen, Calgary Herald and Vancouver Sun. On June 14, 2011, Brian participated in a debate on China’s role in the 21st century as part of The Globe and Mail’s promotion of the Munk Debates. Crowley took the pro argument on the topic, “Should Canada’s oil sands fuel China?” The debate took the form of an op-ed and short online video. Find out more here. I was on BNN last week to discuss the issue of the national securities regulator. Click here to watch. This coming Sunday I will be on Goldhawk Live on CPAC to talk about the election campaign. The discussion will centre around the federal party’s promises over the past two weeks of the campaign, and how economically feasible their promises sound in the context of a large deficit and a healthcare crunch that most agree is headed for a crisis in funding to support our aging population. Brian discussed climate talks in Cancun and the deepening US economic mess on CBC’s Lang & O’Leary Exchange. Click here to watch the segment, which starts at the 36-minute mark. 9 December 2010.